As we all know, the Google Search Appliance will be discontinued at the end of 2018. Many vendors advise a re-evaluation of the requirements for an enterprise search system. We see things differently: When done in the right way, a migration doesn’t have to spin out of control and turn into a big project. Quite the contrary! "After a year of intense cooperation with Mindbreeze and the switch from many Google Search appliances, we can only confirm that we made the right choice. For any GSA customers in Latin America and also for GSA partners who are currently performing a manufacturer evaluation, we are pleased to act as a contact source about best practices." We made sure all features that you know and love from the GSA are available with Mindbreeze InSpire as well. There’s a huge difference between an appliance and a software stack. That’s why we decided ten years ago to approach search as a plug and play product, deployed as an appliance. Out-of-the-box, Mindbreeze InSpire comes with connectors for more than 450 sources. Every source that was covered by the GSA is covered by Mindbreeze as well. Moreover, with the “GSA Facade” for Mindbreeze InSpire, we make sure that your custom GSA connectors can still be in place. Enterprise Search goes far beyond a search box and a result list. Mindbreeze InSpire uncovers, organizes and semantically analyzes data to allow existing or synthesized information to be illuminated proactively or interactively. Mindbreeze respects the context of the digital workers, continuously providing highly accurate and relevant information. The Mindbreeze Management Center provides a central web-based console to maintain all of your appliances from one point. Mindbreeze has a global OEM contract with Dell, so all appliances are produced directly by Dell, and we rely on a strong international network to support your appliance, regardless of where it is located. Plug and play. Just as you are used to from your GSA. Convert existing GSA configuration to a Mindbreeze InSpire configuration with our migration tools and experience from your Mindbreeze partner. - with over 450 available connectors, and keep your custom connectors running via our Google adaptor. - with the Mindbreeze Search App Designer. No more XSLT needed. 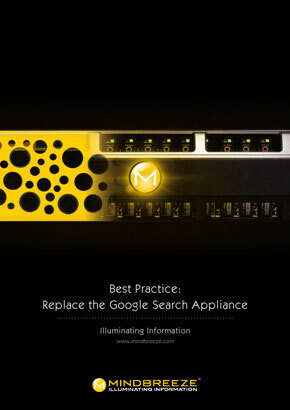 Download Booklet "Best Practice: Replace the Google Search Appliance"
Our team is personally available to answer any of your questions about Mindbreeze as your GSA successor. After submitting the form you will receive the download-link to the booklet via E-mail.